Rain Inscription gives vivid testimony to the paradox that human making is both lasting and fleeting. Its three sections (a sonnet-sequence Q&A with contemporary cultural studies, a renewal of the sayings of Herakleitos and Jesus, and a group of dialogues with contemporary artists) extend an already capacious dialogue beyond its prior limits. What H. L. Hix knows is a radiant mystery, one that he unpeels for us in this book, waiting until we are ready, as the seer might. Now: a movement of circumspection. There: a necessary utterance. The poet writes, “Before prophets offer what is on their tongues, / forfeit to them what is in your hands.” As we move through this etching of water—what is necessary, what gives life—we release gratitude for his gift. 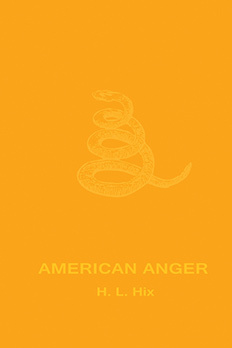 A trigger can be a means to skim or prick one’s dreamscape. 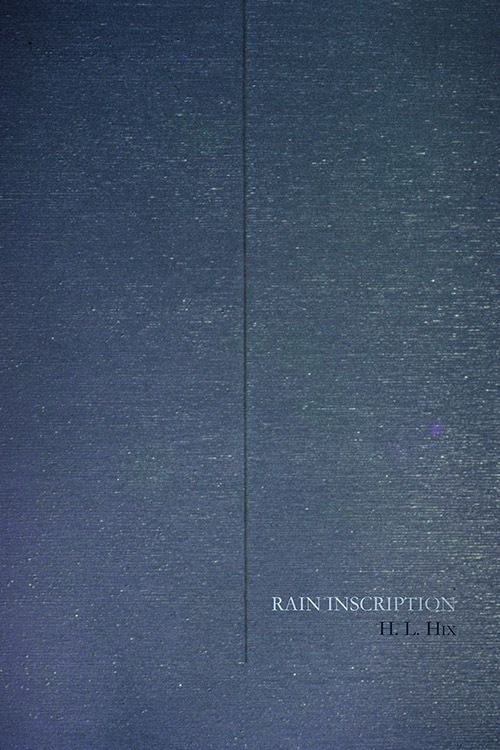 In Rain Inscription, Harvey Hix uses lines from other writers to pose triggering questions. Here is a title from a line by Hans Ulrich Gumbrecht: “What would it mean … to end metaphysics?” Hix answers, not in the sense of giving information, but to attend to the urgent mundane. The last two lines: “I’ll bring you coffee, hear what you dreamed. / Meanwhile, this dawn. That bird. You. Now. Here.” In another of his several series, “Logoi Sophon,” the questions are more directly answered, but only insofar as there is a questioner and “a sayer.” The philosophical tone affords spiritual room. 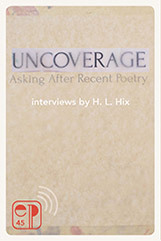 With grace and ingenuity, Hix presents his readers with questions we didn’t know we wished to ask. Harvey Hix is a philosopher with a gift for—which is to say, a gift for getting lost in—song. 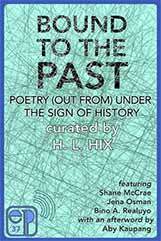 That might remind you of Wallace Stevens, just as Hix’s formal variety and fine madness might recall some combination of George Herbert and Hart Crane. Finally, though, the strict, eccentric music that Hix makes is utterly his own.